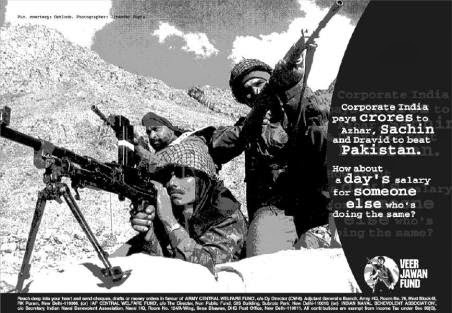 I wanted to write something else on the soldiers but just randomly a thought struck up to cover the kargill war in a prose format so that people can easily understand the struggle that continued that summer in 99 . People understand and remember just a few names and places and dont understand the importance of the freedom we got during that war. For people to properly respect the soldiers a basic understanding of the bloodiest war was needed so I decided to write it all down in plain layman`s language, easily understandable to all. Decided to pen down this war where the Army , Air Force, Navy, Media and the Public played its part. I am the summer of 99 , the summer which turned bloody because the integrity of the nation was at stake. 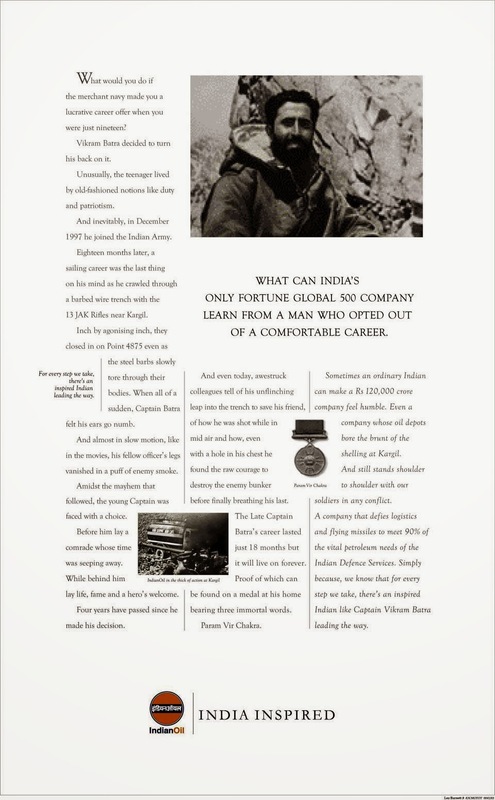 The same summer when the icy peaks and inhospitable terrain was occupied by people who were not meant to be there. 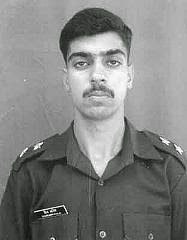 The summer which turned red when the braveheart Saurabh Kalia did his duty to safeguard the boundary of the country but was captured. A captivity which was inhuman to say the least and a torture which is given only in hell. 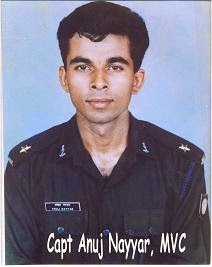 I salute his sacrifice which is no less in any means for he upheld his duty and traditions of the army in the highest order. Drass, Kaksar, Batalik were in foreign hands now and help was needed. The Air force took the lead in providing support and immediately suffered casualties. 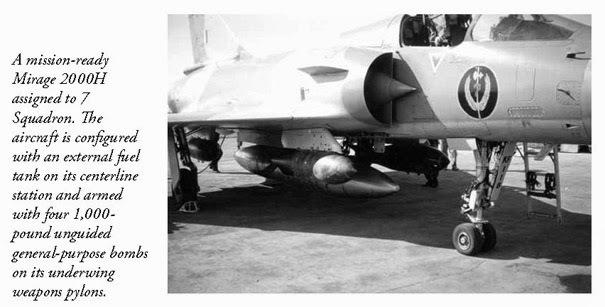 I witnessed the MIG 27 of Nachiketa flaming out at high altitude and ejecting for flying at such height had not been tried before. I saw his comrade Sq. 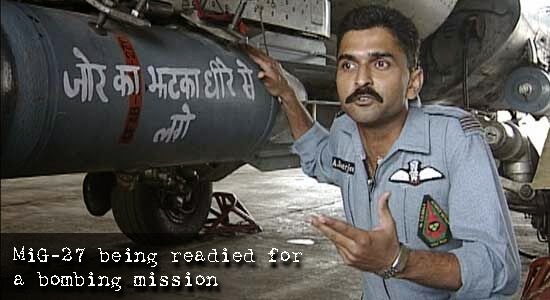 Leader Ajay Ahuja following him to provide help in his MIG 21 with no regard to his own personal safety. He lost his life when his plane was shot down and he was captured and executed in cold blood. 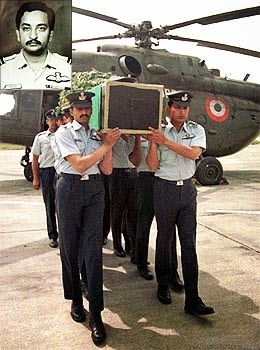 The losses of the Air force didn’t stop just here, they lost a crew of a Russian Mi 17 attack chopper. It was not only about the air, it was the land also where the country suffered losses in conditions which make even the angels shudder. Inspite of all that I witnessed the soldiers fight and even suffered shelling on NH 1 – the lifeline of Kashmir. It was a choice between carrying ration or ammo and they chose the latter for there is no hunger until the nation is captive. I still remember that telephone booth which witnessed the soldiers lining up to speak to their families to let them know they were alright for I didn’t knew I would see them again or not. I saw the Gurkhas attack Kukarthang under Manoj Pandey despite suffering heavy casualties under Pakistani mortar and artillery fire. I witnessed the capture of Batalik. The struggle reached every household in the country and Kargill and Drass became household names. The sacrifice of the soldiers united the people in grief and proud in their bravery. The soldiers reached their villages martyred and kargill was no longer just a part of Kashmir, It was now found from the deserts of Rajasthan to the Northeast, from the plains of Punjab to the beaches of Kerala. I was everywhere between the people of the country. I saw the fight to take back Tololing so that NH 1 remained safe, for the loss of it would render Leh/ Ladakh cut off from the country and Siachen would be lost forever. The fight was never easy as the 18 Grenadiers took on fog and heavy casualties with no big gun support and defending itself from artillery, mortar fire and heavy defences. It was all about shooting in the dark virtually blind as no one knew where was the enemy. The turning point in the war came when the Rajputana Rifles came with the Bofors to answer the foes back in the language they understood – direct hits. Not every reinforcement is perfect as Capt. 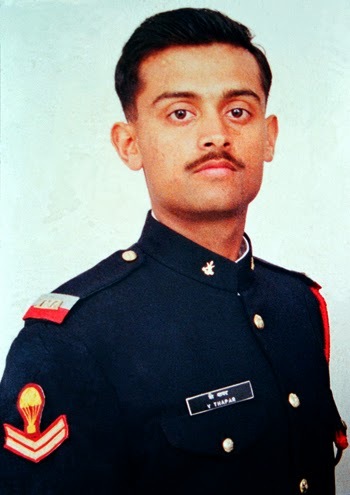 Vijyant Thapar became a martyr. The soldier who wished to see his family from the heavens above by the time his father got his last letter. The most lethal strike fighters took off from Srinagar, Avantipur and Adampur. 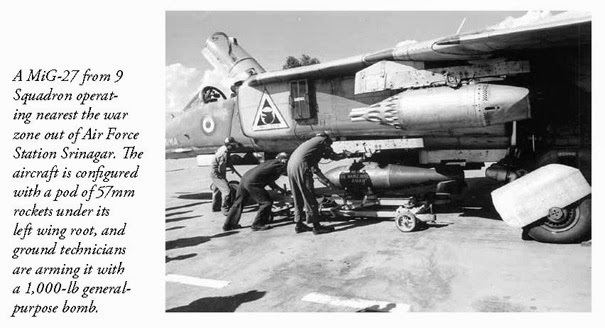 The Air Force operated with MIG 21,23,25,27, Mirage , Jaguars, chopper gunships with heavy limitations. It was a choice between flying the machine safely, the dangers of being hit or hitting the friendly forces. 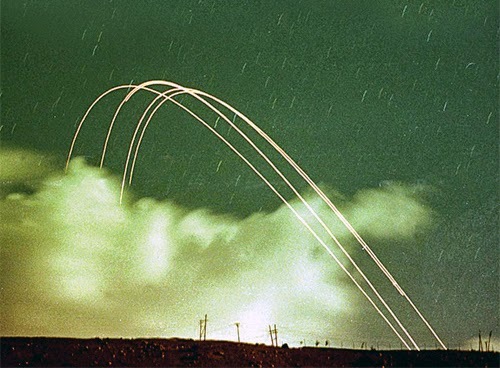 Bombing from 10,000 m above ground is impossible but LGB * kits made precision strikes possible. 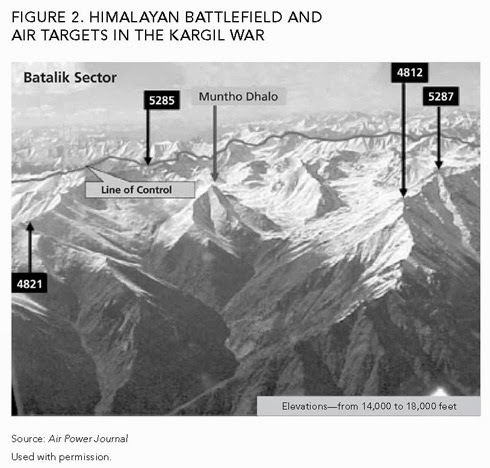 expanse of blinding snow, Mirage 2000 provided the strike capability, bombing the enemy supply camp at Muntho dhalo in batalik, Tiger Hill and point 4388 so that the soldiers face less resistance. Guarding the fighters during the strike missions were the MIG29 who made sure that the enemy F 16 did not venture any close. I saw 7500 sorties by the planes, striking targets and airlifting tons of logistics. I saw 300 guns, mortars and MBRLs fire daily in the whole area which was occupied. Capt. 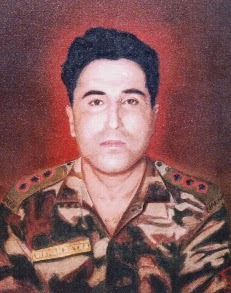 Vikram Batra came to the fore when his 13th J&K captured point 5140 after emerging victorious at Rocky mount. It was the most crucial period of war and the ones which turned the tide of war in India`s favour. I am that part of Kargill. It was not easy taking back tough terrain from the enemy so a unison of sorts was formed. could be freed, it was a fight that went on for the next 13 hours. The firing by the guns seemed to the roar of a 100 lions readying for attack. The Grenadiers attached Tiger Hill and only Yogender Yadav survived and despite being seriously wounded got the word back about the coming reinforcements. It was a bloody battle. The 17th Jat took on 3 pimples complex and lost Capt. 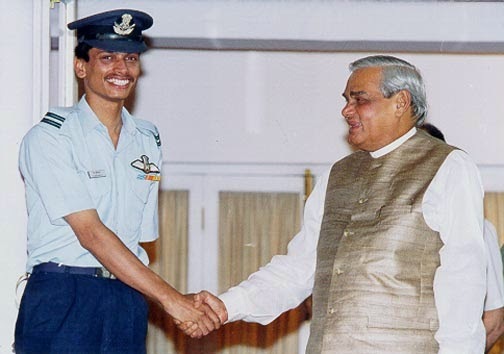 Anuj Nayyar to a RPG while he cleared point 4875. The Gurkhas lived up to their name of being the fearless ones and took on Khalubar where Manoj Pandey laid down his life clearing enemy bunkers. He certainly killed death before accomplishing his goal to emerging victorious. 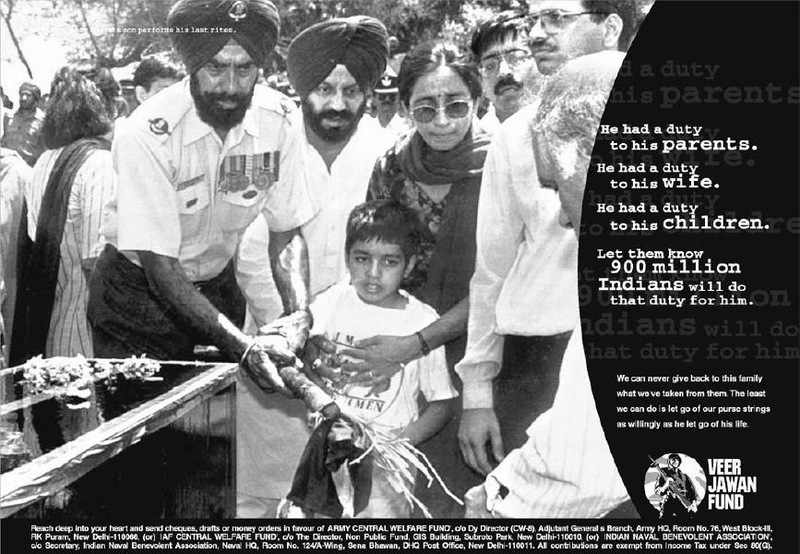 His Dil maange more and he became a martyr freeing the bunker complex. He was Capt. 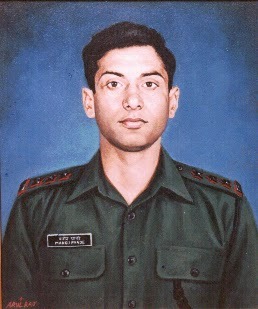 Vikram Batra. 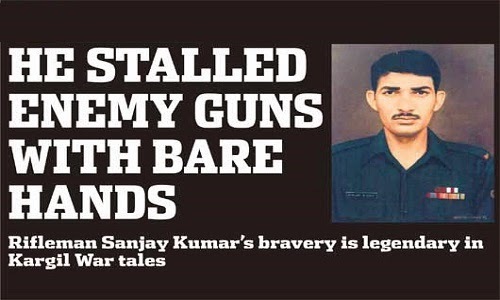 Rifleman Sanjay Kumar stalled the enemy machine guns with his bare hands so that his comrades can move forward and finish the enemy. The hills resonated with the war cries, right from Sarvada Shaktishaali, Bole So Nihal Sat Sri Akal, Raja Ramchandra Ki Jai to Durga Mata Ki Jai, Jat Balwan Jai Bhagwan, Ayo Gorkhali and many more. proper burial when their own army refused to take them. even though it seemed the easier way to end the war and minimize losses. fleeing foes planted when they were given ultimatum to clear my land. The media became force multipliers , forming an opinion to the world that we are right in taking back our land. thudded in the hills around it, not knowing which shell has their name written on it. to know that what was going on the war front. The Maha Vir Chakra and The Vir Chakra. The navy proved to be another silent yet effective defender. try anything fancy or else a repeat of 1971 could be done. 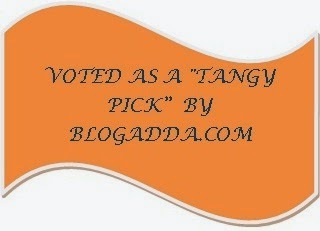 Everyone honoured the heroes alongwith me. The people jammed roads to pay respects to the martyrs and welcome the heroes back. soldiers making sure that they too contributed their bit. all age groups…during and after the war. I salute their sacrifice even till today. I am that bloody summer of 99. I am the summer of Kargill..
MBRL- Multi Barrel Rocket Launchers. Major R S Adhikari's sister Mamta, stands in silence after laying a wreath on the mortal remains of her brother. 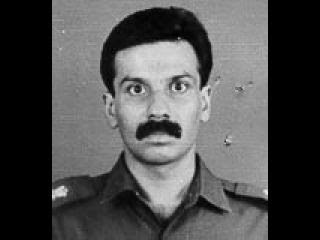 Major Adhikari made the supreme sacrifice in Tololing. 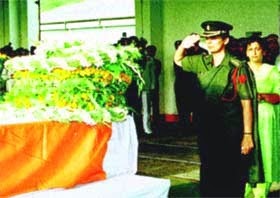 Capt Jayashree saluting the mortal remains of her husband, Major Vivek Gupta, who was killed in the Army operations. My only aim to write this- those who dont know what it takes to preserve freedom and have no clue how much the country sacrificed in terms of the soldiers in claiming our land back should definitely read this. Other than this, this is meant to uphold the bravery and courage of the armed forces so that the soldiers dont fade into oblivion...never.